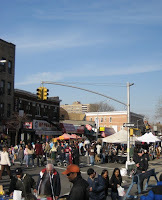 Say what you want about the Ave. but it was rocking on Sunday. 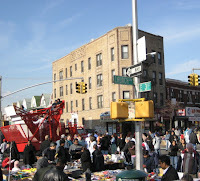 The semi-annual Church Ave. Bonanza put on by Kensington Merchant Assoc. was a hit. Since I had to work until 4pm I didn't arrive until 5-ish and was met with a huge crowd. The pony rides for $5 and other kiddie fare seemed to be a big hit as were the other random street fair vendors. For those of us who live near and frequent Church know we are in need of more differentiation in business there. As you can see from the pictures we got a lot of people around willing to spend. I vote for a coffee shop, a health food store and a kid and family friendly restaurant.